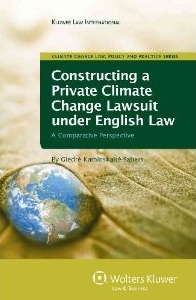 The liability of damages caused by climate change under UK law has been examined in a recent book: “Constructing a Private Climate Change Lawsuit under English Law: A Comparative Perspective” by Giedré Kaminskaité-Salters, Kluwer Law International, ISBN: 9789041132536. In the book the author focuses on why and how climate change litigation should be done in the UK. The Author writes that there have indeed been a few such U.S. cases, but in other regions of the world, such as in the UK, there is little activity in this legal field. Therefore; Ms Dr Giedré Kaminskaité-Salters writes about how the current legal framework actually allows for polluters up until now to have limited their liability, and then she goes on to explain what criteria would need to be fulfilled for courts in England and the UK to hear climate change claim trials, and which tort laws - such as public nuisance or product liability laws - allow for such cases to be brought forth and possibly succeed in the UK.